Once in the scene, assets and collections can be moved, rotated and resized. The following are actions an Intuiface designer can perform on assets and collections in a scene. Content can be moved. Using the mouse, grab any portion of the asset or container to drag it to a new location in the active space. The upper left hand corner of each asset and collection is located at the X, Y coordinate represented in the Properties Panel below the design space. Users can manually update the X, Y coordinate for precise placement of an asset or collection without use of a mouse. Content can be moved horizontally or vertically. To constrain the movement of content to horizontal and vertical axes when using your mouse, hold down the Shift key. Content can be resized. Using the mouse, grab any of the small boxes located on the container of an asset or collection and then drag them to increase or decrease the content's size. The Width and Height of each asset and collection can be found in the Properties Panel below the design space. Users can manually update the Width and Height values for precise changes in the size of an asset or collection without use of a mouse. Content can be rotated. 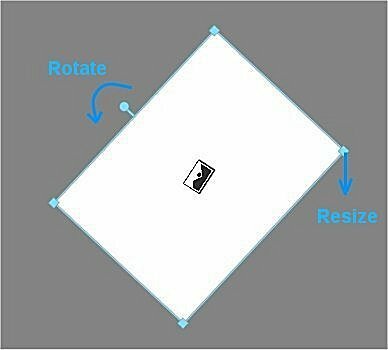 Using the mouse, grab the small circle located above the middle of the container for an asset or collection and then drag it to rotate the content either clockwise or counterclockwise. The Orientation of each asset and collection can be found in the Properties Panel below the design space. Users can manually update the Orientation value for precise changes in the angle of an asset or collection without use of a mouse. Content can be layered. Each space is divided into three layers. Layers create depth, establishing whether one asset or container appears in front of or behind some other asset or container. You can see these three layers in the Space Content panel found in the bottom left of Composer, referred to as Bottom, Middle and Top. Scenes can be zoomed. To zoom in and out of the scene, drag the magnification slider located just below the bottom-left corner of the scene. . You can also manipulate the zoom level by pressing the Control key while rotating your mouse wheel.